Thanks to everyone for the great landscaping advice – I’ve got a running list of things to check out now. While we wait for the hardwood varnish to dry completely (STILL….will it never end? ), we’ve been entertaining ourselves by fixing exterior annoyances. Yesterday the weather was beautiful (so rare in Central New York!) so we grabbed the dogs, jumped in the truck, and headed out to Teague’s parents’ house. 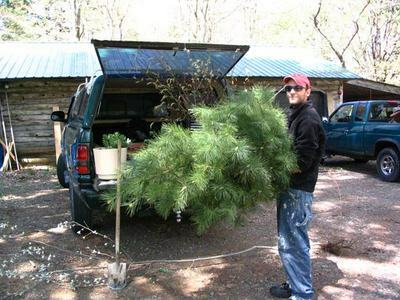 They have somewhere around 30 acres of wooded land, so it’s the perfect place for tree hunting. 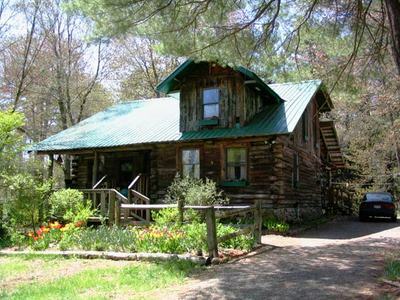 You may remember me mentioning their house before – it’s a log cabin that Teague’s father and mother built by hand, with lumber from their own property. Don is an extreme DIY’er and tackled nearly everything himself, from pouring the basement to stacking the logs to putting on a roof. It is a great place that fits perfectly with it’s surroundings, and I have always admired it. Isn’t it picturesque?!? You should see it in winter, blanketed in snow with smoke swirling up from the chimney. We spent a few hours here roaming around the woods, selecting good-sized trees and a few smaller plants for the flower beds. Digging them up was easier than I expected – the pines were simple. The hardwoods had more roots and took longer to extract. Our haul included 9 white pines, 3 small poplars, a handful of lilac bush stalks, 1 pretty tree we haven’t identified yet, and a few ferns. We filled the whole truck bed with greenery! Finding them was fun, and digging them up was tolerable, but having to put them back into the ground was exhausting. It required such big holes, and we had to drag water to the far-away places our hose wouldn’t reach. Let’s hope that most of them recover from yesterday’s uprooting and find their new home suitable…. I have a feeling that not all will flourish because of our clay soil. We put 6 of the pines (3-4 ft. tall) on the back edge of our property – our house is on a double lot, so our backyard ends at the street and there is no fence. Once they grow larger, they’ll provide some privacy and should also act as a wind break. These were by far the best addition – it looks better already! We would have spent hundreds to get the same trees at a nursery, so the outing was definitely worthwhile. And there’s something nice about knowing where your trees come from! I thought of another way I’ve gotten free plants too, though it’s sad- teardowns. Often when buildings are torn down, the landscaping is just bulldozed. I got a ton of lilies of the valley, some day lilies, sedum and hostas from teardowns. Not sure if this happens in your area- but maybe someone else can use the tip too. I hate seeing plants wasted! Hurray for trees! I bet that looks so fabulous!